At age 26, writer/director Tom Stern’s star was on the rise. He was in post-production on his first film’ ‘Freaked’ which he co-directed with Alex Winter (Bill & Ted’s Bill S Preston himself) and co-written with his regular writing partner Tim Burns and Winter. Besides, Stern was employed at one of the hottest studios in town, Propaganda Films (home to, among others, Michael Bay and David Fincher). “They (Propaganda) made music videos and commercials mostly - they made some films,” Stern said. Stern’s relationship with studio co-owner, Icelandic producer Joni Sighvatsson, proved to be the opening he needed to get involved in the sequel to the legendary horror film. “My career was taking off then because I did the film ‘Freaked.' I must’ve seemed like a pretty good bet, like a hot young director,” he said. “Joni knew me, and he liked me. He asked me if I wanted to get involved with this sequel to ‘American Werewolf in London’ and I was like, ‘Yeah! Great!’. Stern’s ‘Freaked’ collaborator, Tim Burns came on board immediately. “We were still finishing up ‘Freaked’…while we were writing the first draft of ‘Werewolf’, we were editing the trailer for ‘Freaked’ and had the first real big screening at the Toronto Film Festival,” Burns said. “I don’t know if it’s true, but the story I had heard was that John Landis had handed in a draft for this ‘American Werewolf in Paris’ idea and it was kind of a midlife crisis - the same characters 20 years later dealing with this horrible trauma they went through 20 years ago. Because that pitch was this dull letdown, they [the studio] said ‘well, let’s throw a wider net out to some young screenwriters’. The plan was to do it as a very low-budget movie. In addition to co-writing the film, Stern had been eyeing the project off as his next directorial outing - keen to fly solo and show he was evolving as a filmmaker. “I was 25 when I started doing ‘Freaked’, and I turned 26 on the set… I was really young, and I didn’t have a ton of experience yet,” he said. With the studio looking to set the film in Paris, Stern was immediately inspired. “The very first thing that came to mind when I thought about ‘An American Werewolf in Paris’ was the catacombs,” Stern said. “I had visited Paris a few times with a friend of mine who grew up there, who had told me all about the catacombs and how they used to, when they were teenagers, go party in there. They’d explore the closed down parts of the catacombs, wading through waist-deep water… and one time, they took acid and were tripping as they crawled around these ancient catacombs in water with human skulls, just carrying a flashlight in the pitch darkness. So I had that image in my head, that seed of inspiration." Burns says the catacombs proved a big jumping off for another critical element as the two writers prepared their initial pitch. “We started to think about rave culture - it was just starting at the time,” Burns said. Also, the writers came up with a twist on the werewolf mythos - a potential cure for the victim of a werewolf attack. “I’d been thinking about the fact that werewolf movies are different from almost any other kind of horror movie because your hero is also your villain to an extent,” Burns said. The combination of a backdrop that seemed perfect for a horror movie combined with a new take on the werewolf legend and a heavy dose of rave culture was sufficiently tantalising for the studio - with Stern and Burns officially signed on to develop a second draft of ‘An American Werewolf in Paris’. Under the deal, Stern would direct the low-budget film, with Stern and Burns sharing writing duties. Emboldened by their successful pitch and the studio’s endorsement, Stern and Burns set to work developing the story. Uncharacteristically for them, they took their time. “We usually just plunge in and write it and figure it out as we go,” Burns said. But for this, it really was a shot in the dark, and when we actually got that shot, we felt like ‘oh crap, we’d better come up with something impressive.’ So we put a lot of work into piecing together what we thought was a good story." First up, the duo took a trip to Paris to get a feel for the setting, research the story and check out some of the locations that would become integral to the story that they had envisioned. “It’s ‘American Werewolf in Paris’, so you want to use Paris as much as you can,” Burns said. “Since neither of us knew the city that well, we thought it (the trip) was something we had to do. We did it on our own dime. We were in this place, Hotel de Nesle, it was like this student residence almost. They had a free breakfast, so that was what we ate and we slept on the floor. We were kind of like students living as cheaply as we could and trying to get visual ideas, especially since Tom was going to direct. We went down to the catacombs and looked around and went into churches; it was a lot of fun researching the story,” Stern said. With the catacombs playing such an important role, Stern & Burns were keen to check out their centrepiece location, and for Burns, it proved to be as terrifying as the duo had hoped it would end up being on screen. “We were following a tour group, and mostly kept our mouths shut,” Burns said. “But the low ceilings got to me. I suddenly realised that if I wanted to breathe fresh air, it was a 45 minute *walk* back to the surface, and I had a minor anxiety attack!" The duo was also able to find inspiration in the local colour. “One character, our surly police guy LeDuc, he was named after my old neighbour in Ottawa, and we based him on the guy who ran this hotel we were staying in,” Burns said. “He was really grumbly and seemed to be disgusted by the sight of us every day. He also seemed really lazy and annoyed whenever he had to do anything - even just replace a towel in the room. We just thought he was funny - he was like every American’s perfect vision of a disgusted Frenchman who thinks all Americans are pitiful. We were taking a lot of notes while we were there, and a lot of what we ultimately wrote was really infused with what we had been through on our trip." They had the local flavour, they had the basic story, but there was one thing that was still troubling the writing duo - neither had written a fully-fledged horror film before. “I’d never really written anything that had the sincere elements that we knew we needed,” Stern said. “Our first film, ‘Freaked’ was a gag fest,” Burns said. And upholding the tone Landis so masterfully set in ‘An American Werewolf in London’ while living up to the standard Landis had established was a key consideration for the writers as they set about honing the story. As fans of John Landis’ film, both Stern and Burns were acutely aware of the big shoes they were looking to fill. “‘An American Werewolf in London’ is really ground zero for that combination of comedy and horror,” Burns said. In addition to maintaining the tone of the Landis film, Stern said they worked to ensure the characters kept the same accessibility and believability that helped anchor ‘London’. “We had to capture a wit, and there had to be an awareness,” he said. “The characters had to be smart and funny and aware of their predicament like they were in the first one." Both Stern and Burns were keen to carry on Landis’ use of music - as both a source of humour and a means of setting the tone of the film. “Luckily there’s a lot of songs about the moon,” Stern said. “Tim and I were both big music fans, so that was the fun part - you know, looking at what songs we could use. When we wrote it, there was no Internet, there was no 'Googling'; it would have been five seconds of work now,” Burns said. The script, as Burns and Stern envisioned it, began with the classic Pink Floyd track ‘Brain Damage’ featuring the key lyric ‘I’ll see you on the dark side of the moon” as the camera slowly drifts down from the sky to the streets of Paris, where an American academic is pursued (and ultimately seriously injured) by an unseen force. “The song seemed like a really good, bold way to start the film - because it’s so iconic. It’s such an atmospheric song that it would set the mood in a really cool way,” Stern said. After the initial creature attack, we’re introduced to our main character - 22-year-old Andy McDermott, the nephew of the academic attacked in the opening scene. On hearing the news about his uncle, McDermott grabs the first plane to Paris where he meets his uncle’s assistant, the beautiful Serafine (“He was almost like a father to me,” Serafine tells Andy, who fires back with “Was he a father like Ward Cleaver, or like Woody Allen?”). Against Serafine’s wishes, Andy investigates the attack on his uncle, taking him deep into Paris’ underground rave culture, finding himself on psychedelics in a network of creepy underground caves while being chased (and bitten) by a werewolf. 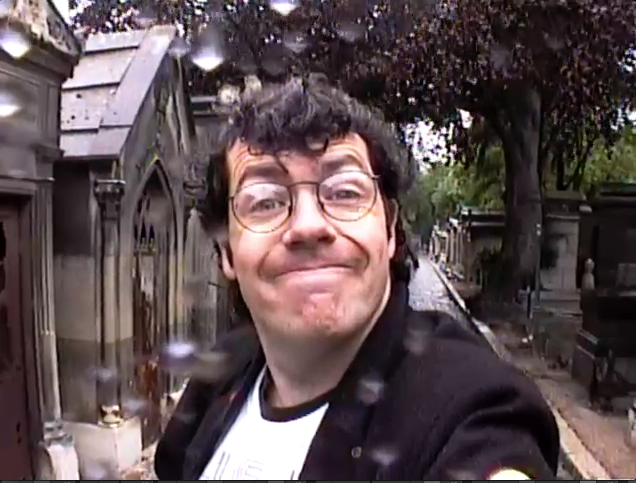 After a twilight tryst with an American tourist at the Pere Lechaise cemetery (final resting place of Jim Morrison, in a scene Burns happily attributes to his writing partner, set to The Doors’ ‘Backdoor Man’) the moon emerges, and Andy turns, chasing and killing both his one-night stand and the French cop assigned to follow him. As with ‘London’, his victims come back to haunt him and urge him to commit suicide (“It’s not so hard,” the ghostly cop tells him “I used to think about it all the time. Maybe you should meet my wife”). From there, Stern and Burns expand on the mythology set out so expertly by Landis in the original. Andy discovers his uncle and Serafine had been working on a drug to help cure werewolves - a drug that, under different circumstances, could also be used by werewolves to control their condition. He also discovers the cure for lycanthropy - eating the heart of the beast that attacked him. But there’s a catch - as Andy discovers the werewolf that bit him was none other than Serafine. “There’s a saying in writing that if you want to reveal character, give your character hard choices… they’ll define your character,” Burns said. Needless to say, the film ends on a melancholy note… all to the strains of Nirvana’s cover of the Cat Stevens song ‘Moon Shadow’. With their second draft nailed down, Stern and Burns submitted it to the studio. And the response they received was exactly what they hoped for. Well, sort of. But not really.